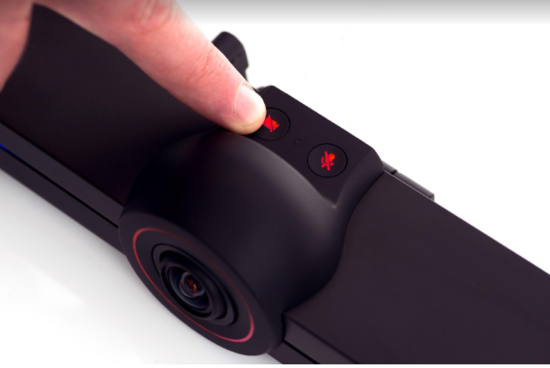 Los Angeles, CA - After HELLO's very successful Kickstarter campaign in 2016, Solaborate is launching the new and improved, End-to-End Encrypted HELLO 2, 4K Touch-Screen TV, HELLO Creator Edition, HELLO Controller, and free unlimited end-to-end encrypted video, audio and messaging. HELLO 2 will also support the best video conferencing platforms such as Microsoft Teams, Skype for Business, Google Hangouts Meet, Zoom, Cisco WebEx, Facebook Messenger, WeChat, BlueJeans, Fuze, Unify, and more. 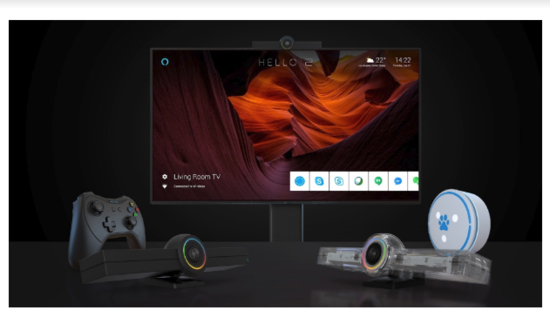 HELLO 2 transforms any TV into the world's most powerful communication device for video conferencing, wireless screencasting, screen sharing, digital whiteboarding, Alexa and Google voice assistant, live broadcasting, gaming, TV streaming, home automation, camera feed with motion detection plus infrared night vision, and more. HELLO 2 is designed together with Solaborate community to address some of the most annoying video and audio communication issues the industry faces today. 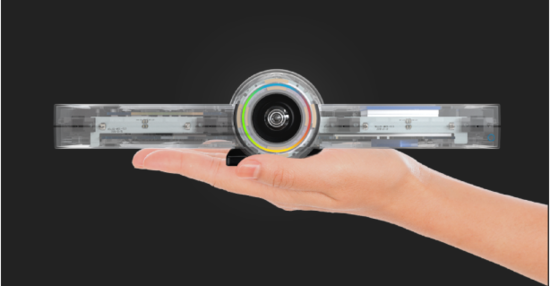 HELLO 2 is equipped with 4 far-field beamforming microphones as well as a 4K HDR video sensor and state of the art 6-element lens, working together to ensure the video and audio captured is of the highest quality. "We believe that privacy is a fundamental human right and that's why we engineered HELLO 2 with two built-in hack-proof privacy controls and end-to-end encryption for everyone's protection and peace of mind," says Labinot Bytyqi, Founder and CEO. 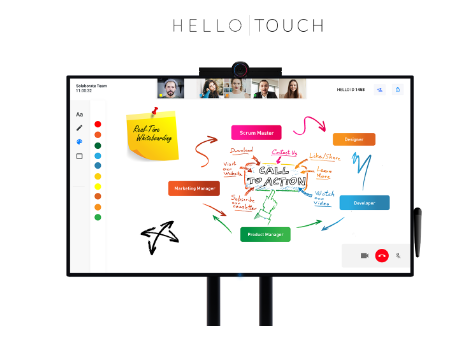 The HELLO Touch TV is the smartest and most affordable 4K Touch TV powered by HELLO 2 for real-time digital whiteboarding and video conferencing by allowing virtual teams outside the physical room to collaborate in real-time from any device to bring new ideas to life. As part of their open platform, Solaborate is also introducing a HELLO Creator Edition specifically designed for the developer community, so they can build any applications or hardware gadget extensions on top of their open and programmable communication platform. This will offer creators programmable end-to-end encrypted messaging, video and audio calls, via their APIs and SDKs. "We can't wait to see what kind of gadgets and apps you will create next, because technology becomes more powerful when it empowers everyone," says CEO Bytyqi. Solaborate seeks to simplify and improve the way we communicate and collaborate by making it affordable for everyone. They are proud to say that HELLO is being used all over the world, connecting people and shortening distances. HELLO 2 and new products are available now on Kickstarter, while end-to-end encrypted HELLO Messenger app can be downloaded on Google Play or App Store. All the backers who supported HELLO on Kickstarter in 2016, will get a full 100% credit of $189 towards HELLO 2 Kickstarter special of $499. \"We believe that privacy is a fundamental human right and that's why we engineered HELLO 2 with two built-in hack-proof privacy controls and end-to-end encryption for everyone's protection and peace of mind,\" says Labinot Bytyqi, Founder and CEO. As part of their open platform, Solaborate is also introducing a HELLO Creator Edition specifically designed for the developer community, so they can build any applications or hardware gadget extensions on top of their open and programmable communication platform. This will offer creators programmable end-to-end encrypted messaging, video and audio calls, via their APIs and SDKs. \"We can't wait to see what kind of gadgets and apps you will create next, because technology becomes more powerful when it empowers everyone,\" says CEO Bytyqi. HELLO 2 and new products are available now on Kickstarter, while end-to-end encrypted HELLO Messenger app can be downloaded on Google Play or App Store. All the backers who supported HELLO on Kickstarter in 2016, will get a full 100% credit of \$189 towards HELLO 2 Kickstarter special of \$499.